Cheerio! Shannon here to share just a wee bit of Portobello Road's vintage flair with a more masculine touch. I used one of the pieces of ephemera as the focal point (this one looks like a miniature Parisian postcard) and popped it up on top of the authentic piece of vintage sheet music. 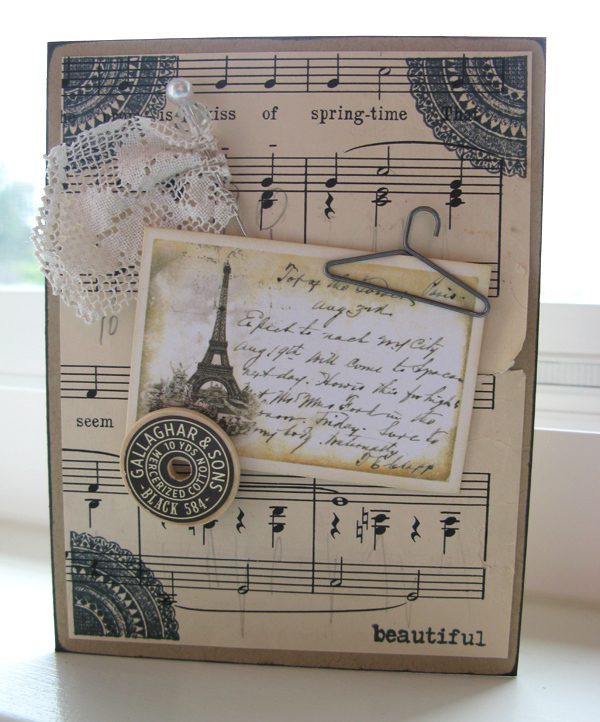 I embellished the sheet music's corners with the quarter "doily" image and then the sentiment "beautiful" from the London Market set. Around the teeny postcard I layered one of the wooden spool tops, the pearl-topped stick pin with a scrap of the vintage lace tucked behind, and for a bit of whimsy, the clothes hanger clip to its corner. I inked the edges with black to give the kraft note card a little more "well worn" look. Oh, and for a bit of fun, I added a clear bead right under the pearl of the stick pin. The bits and bobs of authentic vintage (or fun replica) goodies included in each Portobello Road kit are unique and no two kits are exactly the same. If you're in the San Diego area this weekend and would like to join us as we transform our kits into gorgeous handmade cards, contact Shannon for the details. We've got only a few kits left, so be sure and pick yours up before it's too late! Have a fantastic Memorial Day weekend -- pip, pip!! This is GORGEOUS! I loveeeeeeeeee the postcard, and loving the hanger!!!! How pretty! I love the delicate lace with the pin! This is lovely! Can't believe you made a masculine card from this kit, love the doily corners. Hope you like making your own apron card from the Silhouette.